I thought I’d share some Christmas pics with you over the next few days. 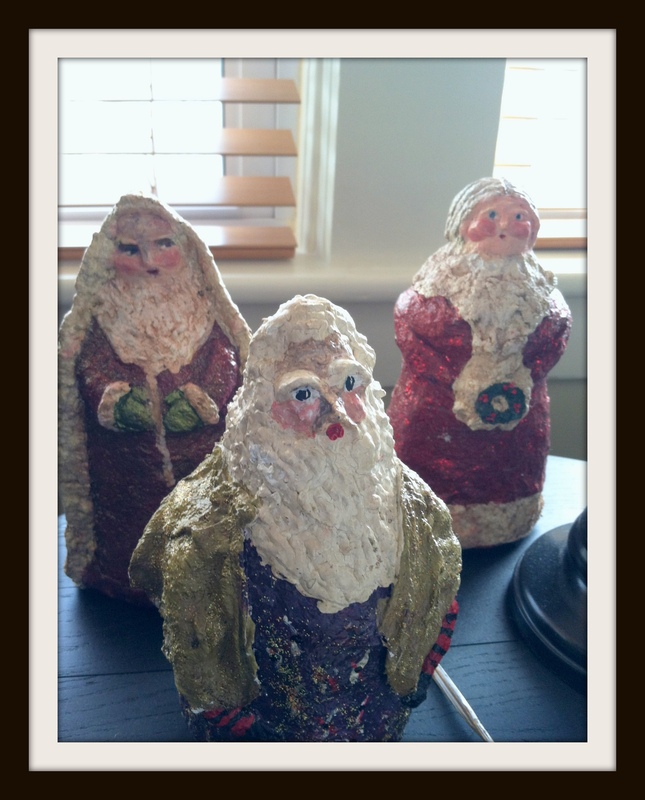 These three figurines shown below are paper-maiche covered bottles. I made them years ago and I love them as much today as I did when I first made them. I would share a tutorial with you but this was way before my blogging days and I wouldn’t be able to anyway because it’s strictly one of those instinctive kind of processes. I think it’s just a matter of applying the paper-maiche and letting the figures “emerge” under your fingers. I used acrylic paint for the final process. I made these out of paper maiche over various types of bottles. 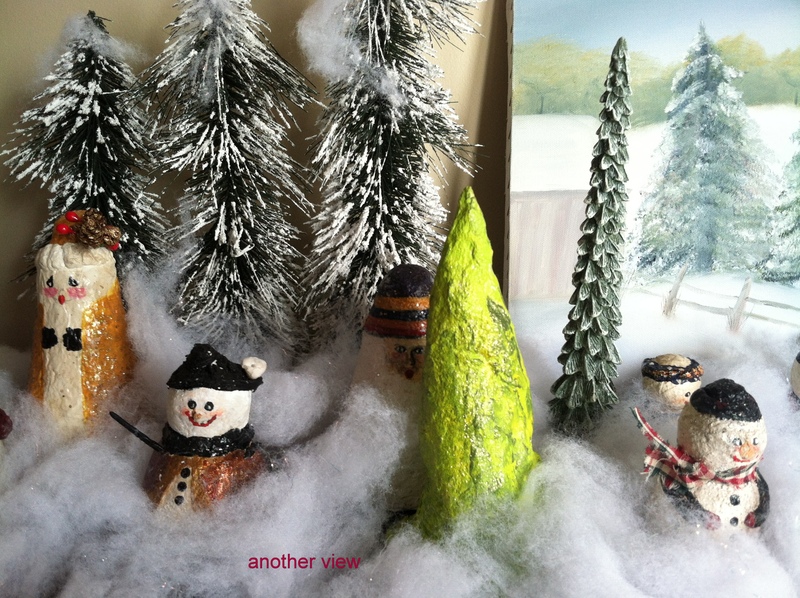 The figurines in the next two pictures are all my little paper maiche people. I love these little guys and getting them out and putting them in “action” is one of my favorite parts of Christmas. I need to make some more. As I was taking out my little guys last year and thinking I wished I had some sort of backdrop, I remembered this painting that has been stored for years. Every year I looked forward to taking out my little guys and letting them “hang around” for awhile. You need to look closely at this next picture to see the Santa head. This was made for me by a best friend. She has made numerous paper-maiche pieces for me over the years and they are some of my favorite pieces. This head is made over a jar. I love how she created the beard. 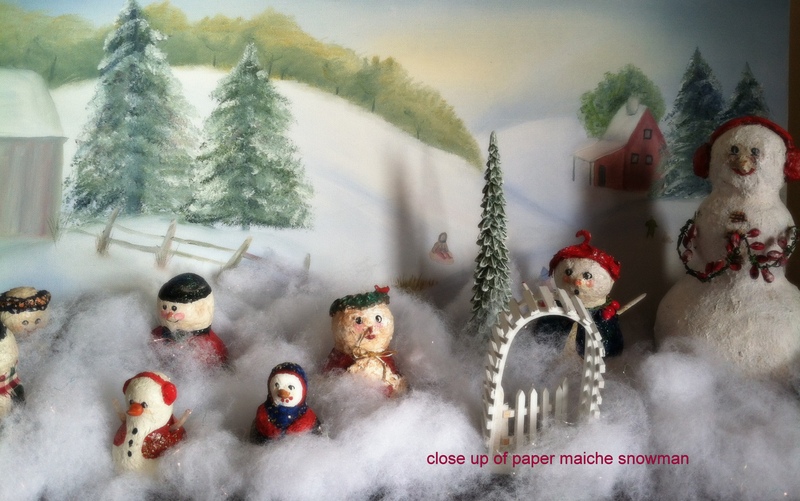 These paper-maiche pieces are always brought out every year. Sometimes I don’t use all my Christmas decorations but these paper-maiche creations are never left behind. Oh, she made the adorable peanut tree as well. The sign is from Hobby Lobby. The trees are my Anthropolgie knock off that were so popular last year. I used my jars with lids up and lids down. They are on a red cake platter. 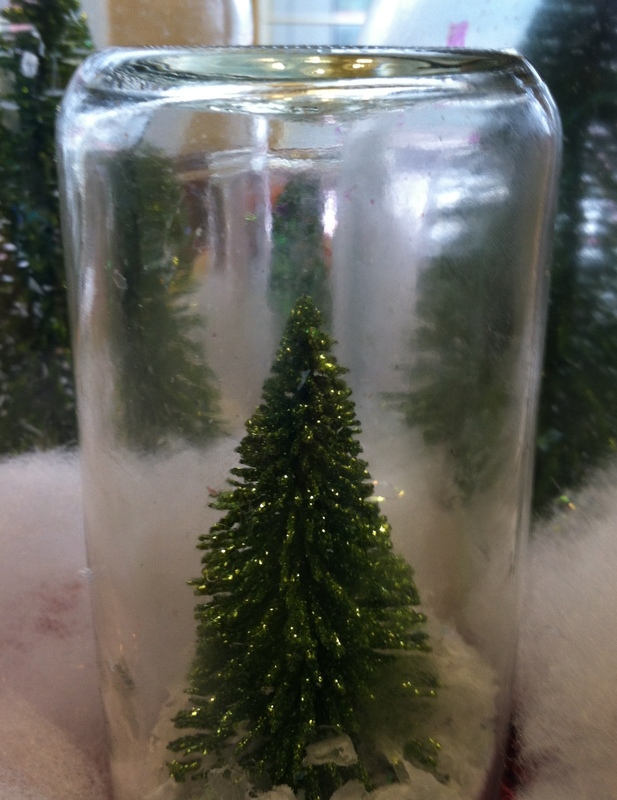 This next picture is a close up of one of the jars. 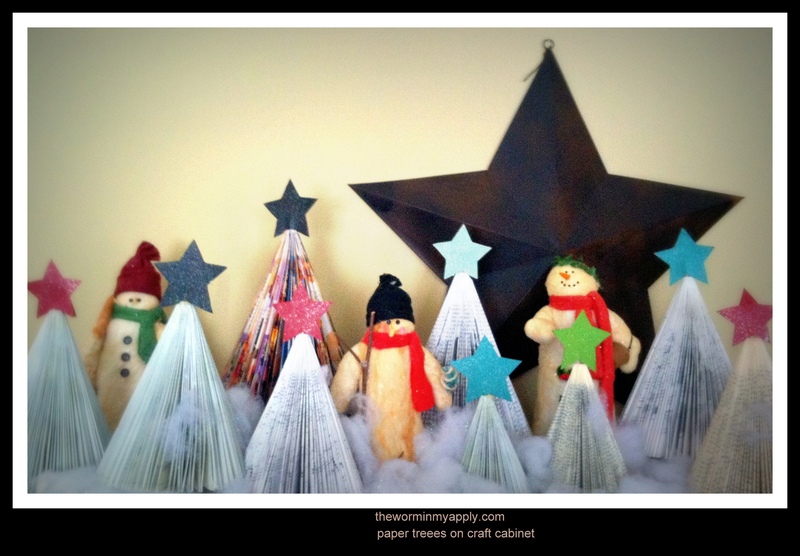 These are my handmade “book” trees. 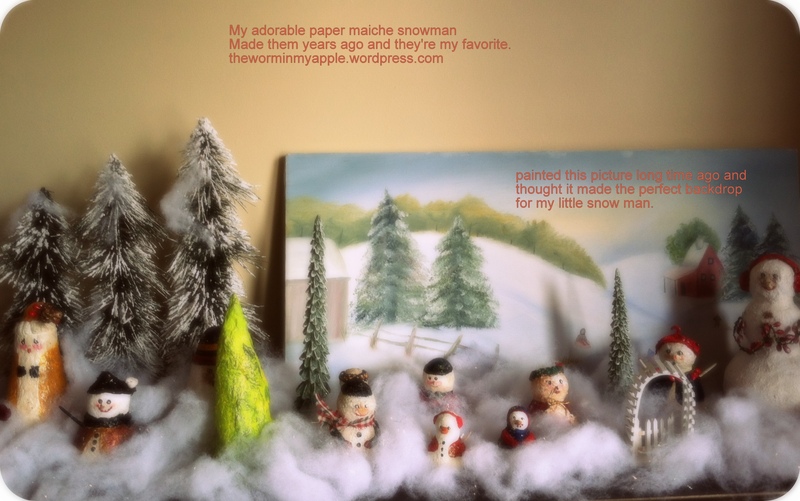 The snowman are felted wool (purchased). I wish I could find more. The stars are wonderful glitter paper from Jo Ann’s. I glue them to a toothpick and then push it into the tree. Works like a charm. 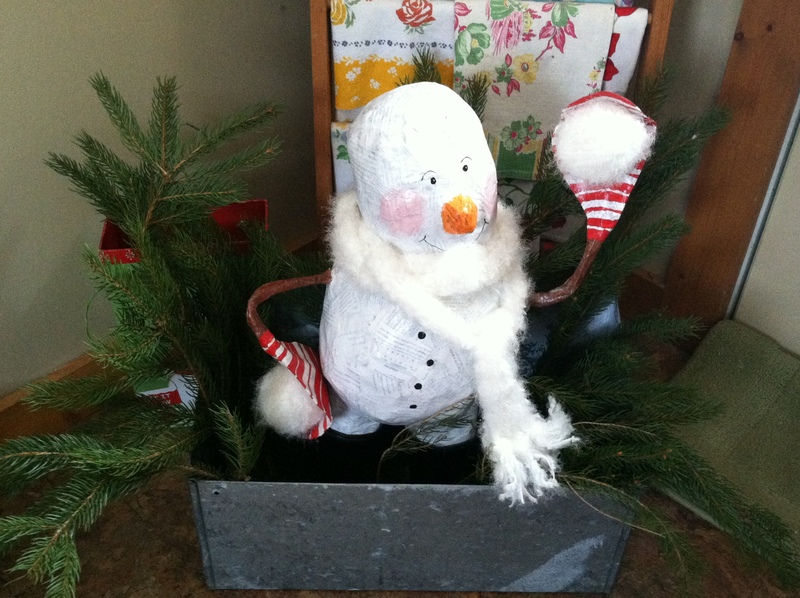 Below is a picture of a paper-maiche snowman my same best friend made for me me a few years ago. Isn’t he adorable? There is lots more to show you and I will as soon as the boxes make it from the basement. Takes me awhile.